We’ve come a long way in the last couple of years. The OSU Superfund Research Center began social media efforts on Facebook and Twitter in August of 2011. In November of 2011, Naomi Hirsch, Research Translation Coordinator, headed to the American Public Health Association Annual Meeting and Expo to facilitate a roundtable discussion on how our Centers’ can harness web technologies and social media. The discussions led to a desire to gather resources, case studies, and articles that would help move our scientists and social media efforts forward. The Web and Emerging Tech Resources for Scientists and Partners page began. 2012 was a year of internal education as we grew our network and supported our colleagues at other NIEHS Centers. We facilitated a web and social media session at the NIEHS PEPH Meeting in March, presented an NIEHS SRP CEC/RTC webinar in July, and later that year, a social media overview presentation for administrators at the SRP Annual Meeting in October. The momentum increased in 2013. We led a movement at Oregon State University by supporting a ScienceOnline Watch Party, which led to a new group, the OSU Science Communicators. The Web and Emerging Tech Resources for Scientists and Partners page grew and was cited as an excellent starting place for scientists in blog articles and the Plos Biology paper: An Introduction to Social Media for Scientists. We recently hosted and tweeted the 2013 International Symposium on Polycyclic Aromatic Compounds (#ISPAC13). Although 75 tweets came from just 10 people during the conference of about 150 total people, it was still worthwhile and brought exposure to PAHs, the organization, OSU, the research, and the individual researchers. It starts small, but it must start somewhere and become part of the culture. Now the education is turning to grad students. We are excited to contribute to and co-instruct a Grad Seminar on Science and Risk Communication, which will include using social media tools. 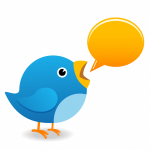 In addition, at the end of the term in December, Naomi Hirsch will host a Twitter Basics webinar designed for scientists, grad students, and professionals communicating science. 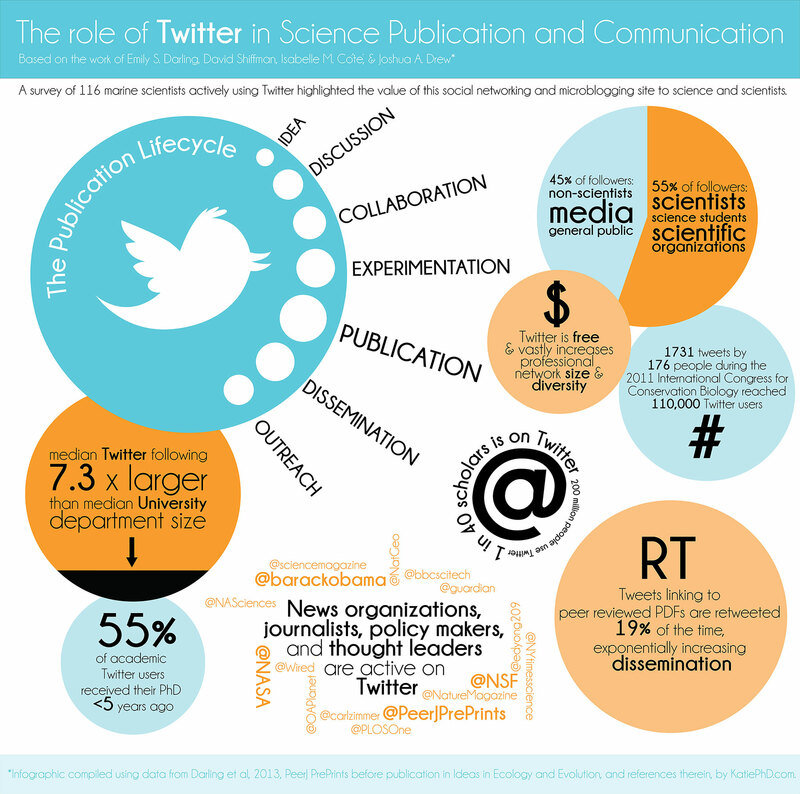 There are now papers (and numerous articles) presenting a case for more scientists to engage with one another and the public through social media like Twitter. Several studies have shown that tweeting and blogging about scientific findings can increase their impact (“It’s Time for Scientists to Tweet“). So, what is ahead for us in 2014? So much! Stay connected so you can find out. Posted in Research Translation, Science Communication, Training. 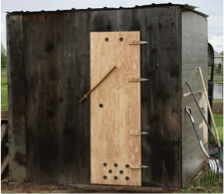 The OSU Superfund Center’s Community Engagement Core is fortunate to have an established partnership with the Confederated Tribes of the Umatilla Indian Reservation (CTUIR). 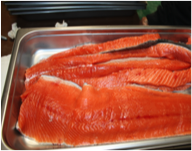 The recently produced CTUIR – OSU 2012-2013 Newsletter shares the background, summary, and findings of a collaborative research project to understand polycyclic aromatic hydrocarbon (PAH) exposure related to smoked salmon. Salmon, a first food, is important to the subsistence of Native Americans living in the Pacific Northwest. Smoking salmon is one of the traditional ways to preserve this seasonally abundant food and make it available year round. People can be exposed to PAHs from breathing contaminated air or eating smoked foods although many other exposure pathways exist. Each volunteer wore air sampling equipment and turned it on every time they went into the smoking structures. 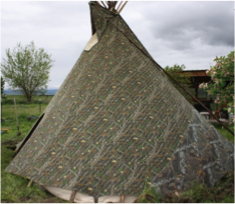 The data showed the air in the tipi and the smoke shed contained PAHs. 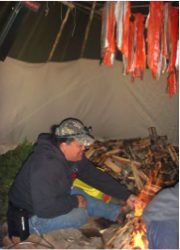 Pictured above from left: Traditional tipi, volunteer tending the fire in the tipi wearing an air sampler in black bag on his hip, traditional smoke shed. The findings from this study were published in the Journal of Agricultural & Food Chemistry. Indigenous cultures perceive the natural environment as an essential link between traditional cultural practices, social connectedness, identity, and health. Many tribal communities face substantial health disparities related to exposure to environmental hazards. We asked 27 volunteers who were members of the CTUIR their opinions on meanings of health and how their environment interacts with their health. The findings from the focus group discussions were published in the journal Environmental Justice. In addition, the CTUIR – OSU 2012-2013 Newsletter shares recently appointed members of the Tribal Advisory Board. We hope you enjoy the newsletter! Posted in Community Engagement, Publications, Research. This year Carlos Manzano received his PhD from the Simonich lab (Project 5), and moved on from the OSU Superfund Research Center (SRC). His research with the SRC focused on the development of new analytical techniques for the analysis of PAHs in complex environmental samples. With Dr. Simonich, he developed an analytical method using comprehensive two dimensional GC (GCxGC/ToF-MS) to analyze around 90 PAHs in one chromatographic run, using a highly orthogonal column combination. For his PhD thesis, they wanted to focus specifically on oxy-PAHs and alkyl-PAHs, which were part of other SRP projects at OSU. They got some standards from other groups, and regularly collaborated with other cores and projects. During his training, he received a prestigious 2012 Student Paper Award from the American Chemical Society (ACS). His work was published in ES & T.
Manzano C, Hoh E, Simonich SM. Optimization of Column Selection for Separation of Complex Polycyclic Aromatic Hydrocarbons Mixtures using GCxGC/ToF-MS. Environmental Science and Technology, 46, 7677-7684. 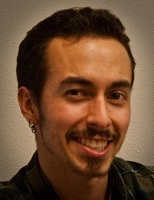 Manzano’s PhD thesis helped him get his current position. He is now holding a postdoctoral Visiting Fellowship in Canadian Laboratories, working in the Canada Centre for Inland Waters as part of the Aquatics Contaminants Research Division of Environment Canada, located in Burlington, Ontario. His research focuses on novel methods and analysis of polycyclic aromatic compounds in oil sands sediments, precipitation and snow samples. The goals are to expand the list of PACs to match reported industry emissions and to identify new PACs that characterize atmospheric emissions from bitumen upgraders as well as dust from mining and refinery waste. 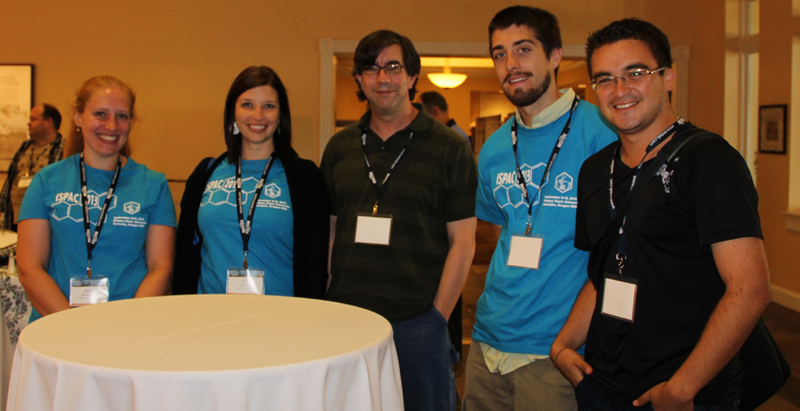 Carlos Manzano (far right) was able to visit with members of the Simonich lab again when he came to the 2013 International Symposium on Polycyclic Aromatic Compounds (ISPAC 2013) conference at OSU from Sept. 8 – 12.
them at SETAC Long Beach in 2012). Posted in Alumni Update, Research, Training. Robert Tanguay, PhD (Project 3 ) focuses on examining the effects of selected chemicals and chemical classes on zebrafish development and associated gene expression pathways. The Tanguay research group recently collaborated with Terrence J. Collins, PhD, a champion in the field of green chemistry at Carnegie Mellon University. Collins and his collaborators showed that specific green chemicals (a group of molecules called TAML activators) used with hydrogen peroxide, can effectively remove steroid hormones from water after just one treatment. Steroid hormones are common endocrine disruptors found in almost 25 percent of streams, rivers, and lakes. Collins needed to understand the safety of TAML activators to move forward on this problem. Tanguay’s group exposed zebrafish embryos to seven different types of TAML activators. None of the TAML’s impaired embryo development at concentrations typically used for decontaminating water. The collaboration resulted in a new journal publication in Green Chemistry. These are important findings that contribute toward TAML activators getting commercialized for water treatment. Endocrine disruptors can disrupt normal functions of the endocrine system and impair development, by mimicking or blocking the activities of hormones in wildlife. Several animal studies suggest that endocrine disruptors can also affect human health, and may be involved in cancers, learning disabilities, obesity, and immune and reproductive system disorders. Robert Tanguay is Director of the Sinnhuber Aquatic Research Laboratory, which is the largest zebrafish toxicology lab in the world. In 2012, Dr. Tanguay received an EPA grant award, “Toxicity Screening with Zebrafish Assay”. The award is for three years and almost two million dollars in funding to examine the developmental toxicology of at least 1000 chemicals. Dr. Tanguay and his research team have tested over 3,000 compounds of interest to the National Toxicology Program (NTP), to complement the ongoing high-throughput screening efforts in the U.S. government’s multiagency Tox21 research program. How do we measure gene expression using zebrafish? Citation: Truong L, DeNardo MA, Kundu S, Collins TJ, Tanguay RL. 2013. Zebrafish assays as developmental toxicity indicators in the green design of TAML oxidation catalysts. Green Chem; doi:10.1039/C3GC40376A [Online 15 July 2013].